It's been an exciting few weeks for fans of both Star Wars and the Lord of the Rings films. 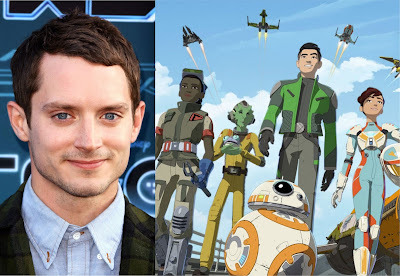 First, it was announced that Dominic Monaghan would be appearing in Star Wars Episode IX, and now we've learned that Elijah Wood will make a guest appearance on the animated series Star Wars Resistance. The announcement came with the episode synopsis, released by the Disney Channel, for the fourth episode (third if you count the two-part first episode as one), "Fuel For The Fire", which will air on Ocotber 21st. He will be voicing the pilot Jace Rucklin. *Elijah Wood (“The Lord of the Rings” trilogy) guest stars as Jace Rucklin. Wood is the latest in a long line of fan favourites from other science-fiction and fantasy franchises to lend their voice to a Star Wars animated series. The Clone Wars saw the likes of David Tennant (Doctor Who), Katee Sackhoff (Battlestar Galactica), and Simon Pegg (Star Trek) make repeated appearances, while Star Wars Rebels brought in Tom Baker (Doctor Who), Gina Torres (Firefly), and Brent Spiner (Star Trek) to voice characters. What's not clear is if this is a one off appearance by Wood or if his character, Jace Rucklin, will be a recurring character. Other actors who have been announced as series regulars (like Donal Faison, Jim Rash, and Bobby Moynihan) are credited as guest stars in the synopses, implying they won't appear in every episode. Perhaps "Fuel For The Fire" won't be the last we see of Jace Rucklin, or hear from Elijah Wood in Star Wars Resistance.